This is a guest post by Adrian Rosebrock. Adrian is the author of PyImageSearch.com, a blog about computer vision and deep learning. Adrian recently finished authoring Deep Learning for Computer Vision with Python, a new book on deep learning for computer vision and image recognition using Keras. In this tutorial, we will present a simple method to take a Keras model and deploy it as a REST API. The examples covered in this post will serve as a template/starting point for building your own deep learning APIs — you will be able to extend the code and customize it based on how scalable and robust your API endpoint needs to be. By the end of this tutorial you'll have a good understanding of the components (in their simplest form) that go into a creating Keras REST API. Feel free to use the code presented in this guide as a starting point for your own deep learning REST API. Note: The method covered here is intended to be instructional. It is not meant to be production-level and capable of scaling under heavy load. If you're interested in a more advanced Keras REST API that leverages message queues and batching, please refer to this tutorial. We'll be making the assumption that Keras is already configured and installed on your machine. If not, please ensure you install Keras using the official install instructions. From there, we'll need to install Flask (and its associated dependencies), a Python web framework, so we can build our API endpoint. We'll also need requests so we can consume our API as well. Our Keras REST API is self-contained in a single file named run_keras_server.py. We kept the installation in a single file as a manner of simplicity — the implementation can be easily modularized as well. load_model: Used to load our trained Keras model and prepare it for inference. prepare_image: This function preprocesses an input image prior to passing it through our network for prediction. If you are not working with image data you may want to consider changing the name to a more generic prepare_datapoint and applying any scaling/normalization you may need. predict: The actual endpoint of our API that will classify the incoming data from the request and return the results to the client. The full code to this tutorial can be found here. Our first code snippet handles importing our required packages and initializing both the Flask application and our model. As the name suggests, this method is responsible for instantiating our architecture and loading our weights from disk. For the sake of simplicity, we'll be utilizing the ResNet50 architecture which has been pre-trained on the ImageNet dataset. If you're using your own custom model you'll want to modify this function to load your architecture + weights from disk. Again, you should modify this function based on any preprocessing, scaling, and/or normalization you need prior to passing the input data through the model. The data dictionary is used to store any data that we want to return to the client. Right now this includes a boolean used to indicate if prediction was successful or not — we'll also use this dictionary to store the results of any predictions we make on the incoming data. If you're working with non-image data you should remove the request.files code and either parse the raw input data yourself or utilize request.get_json() to automatically parse the input data to a Python dictionary/object. Additionally, consider giving following tutorial a read which discusses the fundamentals of Flask's request object. print(("* Loading Keras model and Flask starting server..."
First we call load_model which loads our Keras model from disk. A request is POST'ed to the server. ...but since the model isn't fully loaded yet, our script will error out! When building your own Keras REST APIs, ensure logic is inserted to guarantee your model is loaded and ready for inference prior to accepting requests. This code implies that the model will be loaded each and every time a new request comes in. This is incredibly inefficient and can even cause your system to run out of memory. If you try to run the code above you'll notice that your API will run considerably slower (especially if your model is large) — this is due to the significant overhead in both I/O and CPU operations used to load your model for each new request. To see how this can easily overwhelm your server's memory, let's suppose we have N incoming requests to our server at the same time. This implies there will be N models loaded into memory...again, at the same time. If your model is large, such as ResNet, storing N copies of the model in RAM could easily exhaust the system memory. To this end, try to avoid loading a new model instance for every new incoming request unless you have a very specific, justifiable reason for doing so. Caveat: We are assuming you are using the default Flask server that is single threaded. If you deploy to a multi-threaded server you could be in a situation where you are still loading multiple models in memory even when using the "more correct" method discussed earlier in this post. If you intend on using a dedicated server such as Apache or nginx you should consider making your pipeline more scalable, as discussed here. Starting the Keras REST API service is easy. As you can see from the output, our model is loaded first — after which we can start our Flask server. You can now access the server via http://127.0.0.1:5000. The reason for this is because there is no index/homepage set in the Flask URLs routes. And you'll see a "Method Not Allowed" error. This error is due to the fact that your browser is performing a GET request, but /predict only accepts a POST (which we'll demonstrate how to perform in the next section). When testing and debugging your Keras REST API, consider using cURL (which is a good tool to learn how to use, regardless). The -X flag and POST value indicates we're performing a POST request. We supply -F image=@dog.jpg to indicate we're submitting form encoded data. The image key is then set to the contents of the dog.jpg file. Supplying the @ prior to dog.jpg implies we would like cURL to load the contents of the image and pass the data to the request. 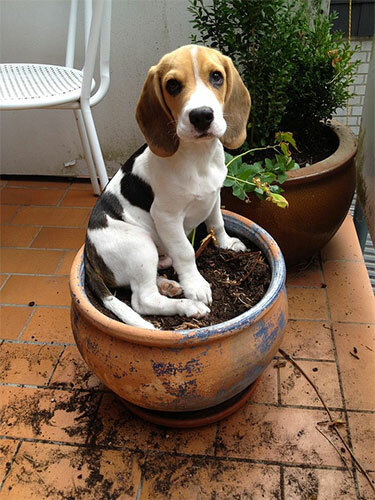 Notice how the input image is correctly classified as "beagle" with 99.01% confidence. The remaining top-5 predictions and their associated probabilities and included in the response from our Keras API as well. In all likelihood, you will be both submitting data to your Keras REST API and then consuming the returned predictions in some manner — this requires we programmatically handle the response from our server. The KERAS_REST_API_URL specifies our endpoint while the IMAGE_PATH is the path to our input image residing on disk. Using the IMAGE_PATH we load the image and then construct the payload to the request. Once we have the output of the request, r, we can check if the classification is a success (or not) and then loop over r["predictions"]. We have successfully called the Keras REST API and obtained the model's predictions via Python. The code covered in this tutorial can he found here and is meant to be used as a template for your own Keras REST API — feel free to modify it as you see fit. Please keep in mind that the code in this post is meant to be instructional. It is not mean to be production-level and capable of scaling under heavy load and a large number of incoming requests. If you're interested in a more advanced Keras REST API that leverages message queues and batching, please refer to this blog post. If you have any questions or comments on this post please reach out to Adrian from PyImageSearch (the author of today's post). For suggestions on future topics to cover, please find Francois on Twitter. I see this question a lot -- how to implement RNN sequence-to-sequence learning in Keras? Here is a short introduction. Note that this post assumes that you already have some experience with recurrent networks and Keras. 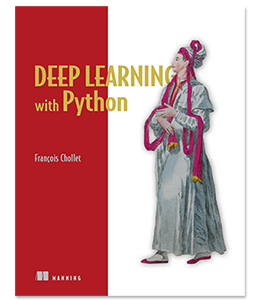 This post is adapted from Section 3 of Chapter 9 of my book, Deep Learning with Python (Manning Publications). This post is adapted from Section 2 of Chapter 9 of my book, Deep Learning with Python (Manning Publications). It is part of a series of two posts on the current limitations of deep learning, and its future. This is a step by step guide to start running deep learning Jupyter notebooks on an AWS GPU instance, while editing the notebooks from anywhere, in your browser. This is the perfect setup for deep learning research if you do not have a GPU on your local machine. 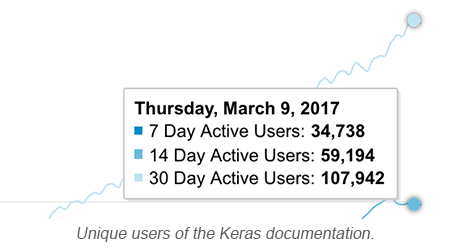 Keras was released two years ago, in March 2015. It then proceeded to grow from one user to one hundred thousand. In this tutorial, we will walk you through the process of solving a text classification problem using pre-trained word embeddings and a convolutional neural network. The full code for this tutorial is available on Github. In this tutorial, we will present a few simple yet effective methods that you can use to build a powerful image classifier, using only very few training examples --just a few hundred or thousand pictures from each class you want to be able to recognize. If TensorFlow is your primary framework, and you are looking for a simple & high-level model definition interface to make your life easier, this tutorial is for you. Note: all code examples have been updated to the Keras 2.0 API on March 14, 2017. You will need Keras version 2.0.0 or higher to run them. The purpose of Keras is to be a model-level framework, providing a set of "Lego blocks" for building Deep Learning models in a fast and straightforward way. Among Deep Learning frameworks, Keras is resolutely high up on the ladder of abstraction.